FINALLY! A heavy duty, direct replacement upper strut mount to replace the weak factory mounts for the Shelby GT500 that can be used on the street! The Steeda street heavy duty upper strut mounts are manufactured to the same exacting tolerances as our industry leading caster/camber plates. They utilize a roller bearing that exceeds OEM specs to ensure precise suspension control. Will not fail on lowered cars like the factory piece. They eliminate the "popping" sound that is common on lowered cars when the factory upper mount fails. Unlike the factory piece, you can also get an extra 1 degree of camber in each direction with these plates as well. Steeda's heavy duty upper mounts are specifically designed for street use and will not show any increase in NVH when installed. Set of two. These Pro-Kit lowering spring sets are Eibach's most popular springs--and there's a reason for that. These springs reduce fender gap to give your vehicle a lower, more aggressive stance. 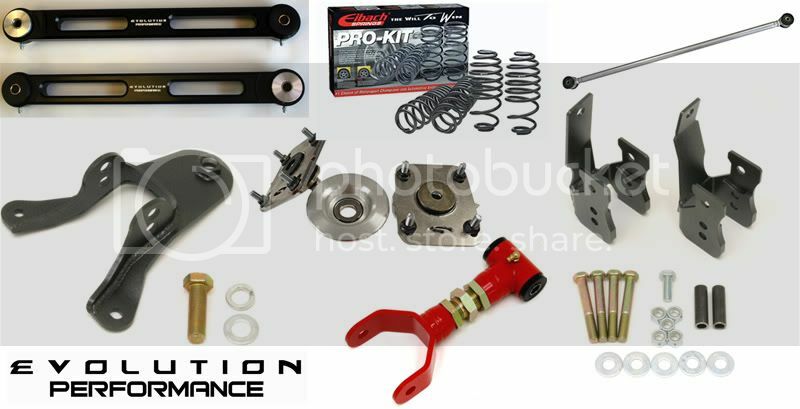 Plus, Eibach Pro-Kit lowering spring sets help to lower the center of gravity to improve handling during acceleration, cornering, and braking. Best of all, you can lower your vehicle without having to change your shocks. Lowering Specifics: Front -1.5", Rear - 1.7"
Need to reduce wheel hop and improve traction? Our New Adjustable 3rd Link with a poly bushing for the GT500 is the ultimate piece for the performance Mustang enthusiast. This competition upper 3rd link, like the original version allows you to adjust your pinion angle. This piece is a double adjustable design allowing you to make adjustments on the car, eliminating the need to remove it from the vehicle for adjustment. Torque deflection associated with the factory piece is eliminated. The single upper control arm is responsible for maintaining pinion angle and preventing axle counter-rotation. This "3 link" style suspension is ideal for autocross and road race applications as it allows the most articulation possible with a solid axle. For drag racing, however, the single, centered link becomes a weak point as the arm is only one inch thick in the middle and made from light gauge, stamped steel. Our upper control arm is made from 3/16" CNC formed plate, TIG welded and gusseted completely around the bushing. The 3rd link is fully adjustable and is powdercoated in Black Hammertone. A good first step toward improved handling out back is to upgrade the panhard bar supplied by the manufacturer with our chrome-moly unit, featuring urethane bushings for reduced flex. And to make a good thing better, we added our heavy duty Panhard Bar Brace for even greater chassis stiffness. Powdercoated Black. We spent countless hours figuring out where the Shelby GT500 could benefit most from chassis stiffening. Here is the end result....Made from 4130 Chrome Moly material this brace is specifically designed for the 2007 Shelby GT500. It ties together the inner/outer frame rails and the rear lower control arm mount. Braces are powdercoated black and come with mounting hardware. Can be bolted in with supplied hardware.